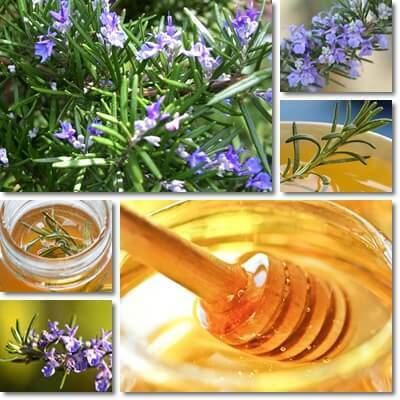 Real rosemary honey is a monofloral variety made from the flower nectar and pollen of rosemary flowers belonging to the Rosmarinus officinalis plant species. Rosemary honey also refers to different varieties of honey infused with rosemary twigs for the purpose of adding a certain flavor to the honey. The two should not be confused because, while honeys boast a similar composition, their properties differ depending on the plant of origin they are made of which engenders differences in therapeutic action, but also color, taste or crystallization time. So what is rosemary honey? It is a variety of honey made, for the most part, from the flower nectar and, incidentally, pollen of rosemary flowers. There are several species of the plant, but Rosmarinus officinalis is the most common. The plant usually flowers in spring, often early, but warmer climate conditions can have it flower throughout summer and well into autumn, as long as the weather is favourable. Flowers can be purple, blue, pink or white and provide an aromatic nectar source for honey bees to use. Italy, Spain and France are the biggest producers thanks to their warmer climates, but not the only ones. Rosemary honey allergy. Pollen is part of the composition of all honeys and holds immuno-modulating properties. If you are allergic to rosemary pollen, this automatically makes you allergic to rosemary honey because it contains pollen too. But honey is also made using enzymes from honey bees. If you are allergic to honey bee enzymes or other elements, this makes you allergic to rosemary and other types of honey, but also to other bee products like beeswax, bee bread, propolis, royal jelly. Because allergic reactions can result in anaphylactic shock, a dangerous, life-threatening condition, it is important to avoid allergy triggers (for example, not eat or otherwise use honey if you are allergic to it). What does rosemary honey look like? The variety is a very light-colored honey, a clear, light yellow, almost whitish, very similar in appearance to acacia honey. Any changes in color (say your rosemary honey is a deeper golden brown) often indicate a lack of purity, meaning that either the honey is not 100% rosemary or that it is an entirely other honey variety. Granted, pure rosemary honey is made mostly from rosemary flower nectar, but not entirely. It also contains varying amounts of other flower nectars, but in limited amounts. This is true for most, if not all monofloral honeys. But a very different, significantly darker color should arise suspicions and tell you that maybe your rosemary honey isn’t rosemary after all. So note the color, read the label and check the origin. What does rosemary honey taste and smell like? The purer your rosemary honey, meaning the less contaminated with other flower nectars it is, the more exquisite its taste. The variety has a fine, moderately sweet taste, but not very persistent. Its aromatic profile includes mild floral and faint fruity notes as well as herbal or vegetal aromas. There are also no traces of acidity or bitterness in its flavor profile. Overall, it’s a fine and savory honey with a delicate sweet taste. The variety has a fast crystallization time and forms fine crystals. Crystallized rosemary honey has a granulated texture and an opaque color. 1) Natural antibacterial. Rosemary honey boasts a mild antibacterial action due to its good content of hydrogen peroxide, an antimicrobial occurring naturally in honey. By limiting bacteria growth and even helping reduce bacteria numbers, the honey can contribute to faster wound healing and encourage a faster recovery following respiratory tract infections, whilst helping reduce symptoms. Its acidity (read more about what are alkaline and acidic foods) and particularly low water content also exert antibacterial benefits and help supress bacteria growth. 2) Good for colds and flu symptoms. Rosemary honey has a poor pollen content (pollen stimulates the immune system response) and a low content of vitamins and minerals that help immunity. Nevertheless, it is a good choice for the common cold and even the flu because of its antibacterial, anti-inflammatory and soothing action. Eating a tablespoon of the raw honey helps soothe sore throat irritation and calm cough, but also reduce bacteria numbers should the infection be located in the throat. It is recommended to not eat or drink anything for an hour after taking the honey and eat 3 or 4 tablespoons a day. 3) Supports good digestion and has prebiotic properties. The natural sugars in rosemary honey make it a natural prebiotic, meaning it feeds the good bacteria in our digestive tract. A healthy gut flora means a good digestion, improved transit time and better overall digestive health. However, it is possible for too much honey to cause diarrhea in particularly sensitive people who respond too well to its stimulating action on a slow digestion and a slow transit. 4) Soothing on the stomach. Eating raw rosemary or other honey varieties on an empty stomach is said to help calm stomach upset and soothe stomach lining irritation in gastritis sufferers. Honey in general is believed to exert a gastroprotective action, hence its use as a natural treatment for gastritis, ulcers or other digestive disorders. 5) Beneficial action on liver health. The variety is also said to help regulate bile production. This would not only support liver health, but also contribute to better digestion. 6) Combats tiredness and fatigue. Being a rich source of natural sugars, rosemary honey helps combat tiredness and fatigue. Its energizing action makes it good for hypoglycemia (low blood sugar levels) as well. 7) Good vitamin and mineral content with tonic effects. Like all honeys, rosemary too contains small amounts of several essential vitamins and mineral, particularly vitamin C and B vitamins, potassium, magnesium, phosphorus, calcium, iron or zinc. Other elements with nutritional value include pollen particles, enzymes, amino acids (proteins), sugars, but also beeswax if the honey is unfiltered. All of these combined give it tonic effects. 8) Great for dry skin, acne, sensitive skin and uneven skin tone. In my experience, light-colored honeys like rosemary make a great natural mask for uneven skin tone and help restore radiance to one’s complexion. Moreover, the honey helps unclog pores and has a delicate cleansing action, removing excess sebum without drying out the skin, which makes it ideal for preventing acne breakouts and for sensitive skin. It’s also nutritious and moisturizing. Conclusion. If you are not allergic to rosemary pollen or honey bees and enjoy delicate flavors, then rosemary honey is a good choice for you. However, remember to always get your honey from reliable sources and check the label for information regarding its origin, purity and processing. The best honey is the least processed, so look for unheated, unpasteurized, unfiltered honey. Also, keep in mind that it is a pricey food so be suspicious of cheap honey. Lastly, the healthiest way to eat rosemary and any other honey is to enjoy it raw, whether on bread, in room temperature tea, on fruit or on its own because cooking or heating it in any way destroys its beneficial properties.